Such right of pre-emption shall not be held to extend to any of the Aborigines of this Continent, except to such as shall have obtained the Governor’s special permission in writing to that effect. The charge of the Indians, and the trusteeship and management of the lands reserved for their use and benefit, shall be assumed by the Dominion Government, and a policy as liberal as that hitherto pursued by the British Columbia government shall be continued by the Dominion Government after the Union. 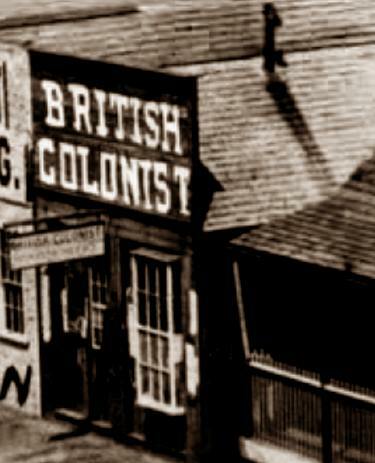 1872-First Nations and Chinese excluded from voting in BC. At this time, First Nations outnumber the non-First Nations population (including a major Chinese population) more than two to one. * * * * * * * * Professions barred to persons not having the provincial vote: Law, pharmacy, chartered accountancy, political office, police, forestry, post office work, public health nursing. 1876-Chinese and First Nations prohibited from voting in municipal elections in the province. 1878-BC passes a law prohibiting Chinese from employment in public works. 1878-The Chinese Taxation Act, 1878, an Act of the BC government, requires all Chinese to pay a license fee of $10 a month. (At that time, 50 cents a day was a common wage for a Chinese, or a First Nations, and a dollar a day for a man of European descent.) The Chinese Taxation Act is struck down by the court because it interferes with the exclusive right of the government in Ottawa to pass immigration laws. 1881-1884-Fifteen thousand Chinese are hired as indentured servants to build the CPR. 1884-BC enacts An Act to prevent Chinese from acquiring Crown Lands. 1885-Euro-Canadian rioters attempt to chase all Chinese from Vancouver. 1890-Under pressure from White coalminers, BC amends the Coal Mine Regulation Act to prohibit Chinese from working at better-paying jobs at the coal face. 1895-Japanese excluded from voting in BC. 1899-The Judicial Committee of the Privy Council, the highest court in the British Empire, strikes down s. 4 of the Coal Mine Regulation Act because it interferes with federal powers regulating immigration. 1907, September 7th-Thousands of Euro-Canadians demonstrate under the banner, “Stand for a White Canada.” They later riot in Vancouver’s Chinatown. 1908-“Gentleman’s Agreement” with Japan limits Japanese immigration to Canada to 400 persons a year. Federal Immigration Act amended, contrary to the laws of the British Empire, to prevent immigration from India, another British colony. 1909-French-Canadian workers encouraged to move to BC to replace Chinese and South Asian lumber mill workers. Maillardville founded. 1911-South Asians excluded from voting in BC. 1914-The ship Komagata Maru, carrying 376 potential immigrants from India, is turned away from Vancouver harbour. 1923-Canada passes the Chinese Immigration Act, 1923, virtually eliminating Chinese immigration to Canada. From 1923 until its repeal in 1947, only twelve Chinese enter Canada as immigrants. 1927-In response to lobbying from the Six Nations in Ontario for self-government and the Allied Tribes of BC for recognition of Aboriginal title, the Federal Government passes the Pursuit of Claims Act making it illegal for any lawyer or other person to receive money to assist First Nations in the pursuit of claims. The Allied Tribes and other First Nation organizations collapse, as well as Euro-Canadian groups such as Friends of the Indians. 1942-Order-in-Council PC1486 prohibits “all persons of the Japanese race” from living within 100 miles (160 km.) of the BC coast. 1947-Chinese and Indo-Canadians gain the right to vote in provincial elections. 1949-Japanese and First Nations granted the right to vote in provincial elections. 1951-The Pursuit of Claims sections, along with sections prohibiting the potlatch, are quietly removed from the Indian Act. 1960-First Nations are permitted to vote in federal elections. 1969-The Federal government issues their White Paper on Indian policy which proposes to abolish Indian status and Indian reserves. All First Nations are to be assimilated into the Canadian population. ~ by fathertheo on September 6, 2008.